Operators: Gorchilin I., Rymarev D., Semin A., Sokolnikov I. Opening of the 20 Congress of the CPSU. City of Moscow. Meeting of the Twentieth Party Congress in St. George Hall of the Grand Kremlin Palace. First Secretary of the CPSU Khrushchev appears to be reporting (synchronously). Congress delegates listen, applaud. 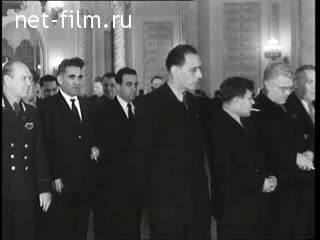 Meeting of the Twentieth Party Congress in St.
First Secretary of the CPSU Khrushchev appears to be reporting (synchronously).